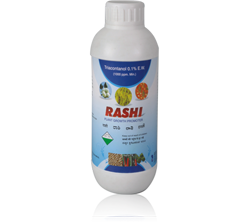 Rashi is a plant growth regulator based on triacontanol formulation. Triacontanol is used in commercial horticulture to improve plant growth worldwide. As a photosynthesis enhancer it increases plant growth in combination with a number of other plant growth regulating actions.Classified as a plant growth regulator it can have a number of commercially important effects on how plants grow. It also enhances cell division and enlargement which can lead to higher expression of genetic potential promoting significantly higher crop yield and improved Quality. Triacontanol can affect growth by its effect on photosynthesis, plant metabolism, and can increase the growth of roots, shoots and flower production.It is easy to mix, use and apply to plants growing anywhere. Rashi is used on leafy vegetable during the development stage of the plant. Increase plant or crop yield. Enhance photosynthesis and plant metabolism. Induce the production of flower buds and flowering. Allow the production of bigger leaves, and bigger root system. Increase cell growth in roots, and used to produce thicker foliage and flowers. Production of robust plants more resistant to disease and pathogens. Increase basal branching of rosette plants, and allow more basal breaks. Improve establishment and growth of young plants produced from cuttings, seed or plugs. Used to help plants suffering nutrient and growth deficiencies.